Good afternoon. My name is Jeanne Manfredi and today I'm going to talk to you about Naples and Southern Italy beginning with the Middle Ages --that exciting Medieval period-- and about what happened in the centuries to follow, up to the time of the reunification of Italy in 1860, and about all the dynasties that ruled in Naples as well as the other forces that molded this part of the country and about how some of those forces influenced and helped to form our own present day civilization. First, to get a bit of perspective, let's set the stage for a few minutes and see what went before and what came after. After living in Italy for the past 18 years, I find I have a new perception of time. We Americans often think of a house that is over 150 years old as either an historic monument or as a wreck that needs to be torn down, and we regard 1492 when Columbus sailed for the New World as almost ancient history. Here, on the Bay of Naples, in 1492 the Italian Renaissance was ending, and ancient history meant when the Greeks first settled down around here in about 800 BC, and about two centuries later founded the city of Neapolis, the New City, that we know as Napoli or Naples. I don't know if you have had a chance to stroll around Sorrento as yet, but while you are here I hope you will go into the Public Garden --theVilla Comunale-- where you can stand on top of the cliffs where you'll get a spectacular panoramic view of the Bay of Naples . Starting from left to right, first you'll see the Island of Ischia in the distance, then the lower lying island of Procida, then Cape Miseno, the beginning of the mainland, and straight across the bay, there is the city of Naples. Going around more to your right, you'll see Mt. Vesuvius, looming up against the sky. Now, imagine almost 2000 years ago standing on this same spot, watching Vesuvius blow its top --literally-- in 79 AD and burying the cities of Pompeii and Herculaneum that lay at its feet. There is a wonderful first hand account of that tragic time; in fact, it is the only first hand account that has come down to us, written by a young Roman, Pliny the Younger who was living in Naples at the time with his mother and his uncle, Pliny the Elder, who was in charge of the Roman fleet. Pliny the Younger describes how his uncle was so intrigued by the phenomenon and also alarmed for his friends who lived at the foot of Vesuvius, decided to set sail and see what he could see. By this time no one could see very much for flames were shooting up into the sky and clouds of ash were obscuring the sun. 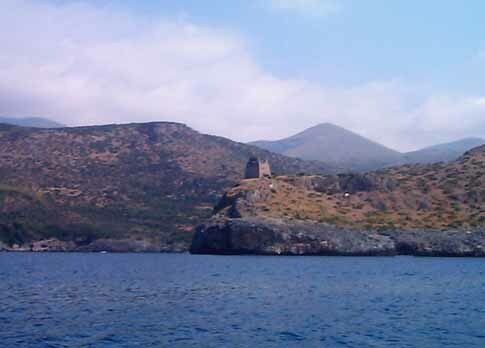 Pliny the Elder and his crew found they couldn't get near Pompeii or Herculaneum so they sailed on further around the Bay to the town of Stabaie, now known as Castellammare di Stabia. Pliny decided to spend the night in Stabaie, but before dawn he and his friends were awakened when the house began to fill up with ash. Here is an excerpt of what happened next: "They had to go out then with pillows tied on their heads to protect them from the storm of stones falling all around them." He goes on to tell how they went down to shore hoping to take to their boat but found that the waves were too high and rough. Pliny the Elder lay down on the beach and called for water. Then, "came more flames and strong fumes of sulfur, he raised himself up and instantly fell back down and died, suffocated by the noxious vapor, for he always had a weak throat." Pliny the Younger goes on to describe how he and his mother tried to flee along with all the other panic stricken people of Naples, surrounded by darkness punctuated by flames and falling ash. It truly must have seemed like the end of the world. Now, still standing on our cliff, let's jump forward almost 1500 years to the middle of the 1500s, and imagine watching the Turkish pirates sail around the point into the little fishing village down below us, the Marina Grande, then the main port of Sorrento. After ferociously sacking the city, they began to sail off with all the nuns and virgins they could find, as well as with the pride and joy of Sorrento, the church bell. Now, the story goes that then the patron saint of Sorrento, Sant'Antonino-- a very old Dark ages saint-- worked another miracle. As the pirates were sailing off, San'Antonino blew up a great storm and the Turks, to lighten their load, threw the church bell overboard into shallow water. Thus, Sant'Antonino saved the church bell! I guess the nuns and virgins went on to the slave markets of Africa. Obviously, nuns and virgins were a dime a dozen in those days, but church bells were hard to come by. Back on our cliffs one last time, leap forward another 450 years to our own time and to an event of which adventure films are made. If you looked slightly to your left you would see a beautiful yellow villa that is built atop and into the cliffs overlooking the sea. During WWII, Benedetto Croce, the famous Italian philosopher, lived in this villa. Croce was a leading anti-Fascist, so he was living here under a sort of house arrest. The Mussolini government, because of his worldwide reputation, left him alone, as long as he was quiet. But, now it was 1944, and the Mussolini government was deposed. Italy had changed sides, the Allies had landed in Sicily, in Salerno and in Anzio, and the Germans were occupying Sorrento. They were also occupying Ischia but the Allies had Capri. Now, Croce was not so safe any longer for the Germans were not noted for their tolerance towards anti-fascist philosophers. Thus, one dark night, coming from Capri, a small boatload of British Commandoes rowed silently beneath the villa, under the noses of the German sentries, climbed the rough steps hewn into the cliff, gathered up Croce, and just as silently took him back to safety on Capri. Now let's leave our cliffs and come to the main focus of this talk, starting with the time between 450 AD and 1450 AD, the Medieval period. The first half is also known as the Dark Ages. How dark were they really? Certainly there were gleams of light here and there, but all in all, they were pretty dark. It is frightening to remember how quickly civilization, with all its attendant skills, can be forgotten and almost lost. The British historian, Kenneth Clark put it best when he said, "We got by, by the skin of our teeth." Cities were depopulated, agricultural methods were degraded, classic manuscripts were destroyed, many lost forever, others only recovered only after centuries of being lost. No one except a very few could read any longer, and baths were a thing of the past. In fact, the early Christian church considered bathing as possible proof that you were still addicted to the old pagan gods. So, if you were truly holy, you were also truly smelly. No wonder they used so much incense in those old cathedrals. So, the Pope called on Charlemagne for help. Charlemagne as the most powerful ruler in Europe, King of the Franks, an empire that included what is now France and Germany. He really deserved his name, Charles the Great. Under his reign, we had what is called, the Carolingian Renaissance, for learning was encouraged and appreciated for the first time in centuries. Charlemagne himself was probably the only ruler in Europe who could read. He learned as an adult, but evidently he never could get the hang of writing. Charlemagne marched into Italy, routed the Lombards and the Greeks, and confirmed the "Donation of Pepin" the great gift of land that his father, Pepin, had given to to the Pope, land that was to become the Papal States. At Christmas time in 800, while the the Pope was returning the favor by officially anointing him in the old St. Peter's, the Pope surprised all, some said, including Charlemagne, by also anointing him as the Holy Roman Emperor. That was to have disastrous consequences for both their successors in the centuries to come. The only tower standing in Naples from before 1000 a.d.
Now, let's look at what was happening here in the South by the year 1000. The three forces who clashed interminably were the Lombards, who had all moved south by then, The Byzantines who still claimed the whole country, and the Arabs who had conquered Sicily in the 800s. then there was the papacy whose lands bordered the South and who claimed spiritual overlordship over all, and the Holy Roman Emperor, up in Germany by this time, who claimed temporal overlordship over all. Naples was quite happy with its Byzantine owners. Constantinople allowed it to have its own Duke, and what could be better if you have to be ruled by an outsider than that outsider is very far away. Besides, Naples had Greek roots. The Mediterranean had always been its front and back yard, one leading to the East and Africa, the other to France and Spain. Now, came a new indomitable force to be reckoned with --the Normans-- not too far away from being the rapacious Vikings who had settled down in the North of France to which they gave their name, Normandy. They first came as adventurers and mercenaries, joining up with first one side and then the other. But, they had two qualities the others lacked. They were not only fearless, they were born administrators and they believed in using the rule of law, to their own advantage, of course. Thus, began the First Norman Conquest, over 20 years before their more famous cousin, William the Conqueror landed in England in 1066. Before the Conquest of Southern Italy had finished, two brothers were playing the starring roles. Robert, called the Guiscard, meaning like a sly fox, and his younger brother, Roger de Hauteville (Altavilla in Italian). Robert soon had a grand opportunity to get a better claim on the country by marrying into a leading Lombard family. Sichelgaita was the sister of the Prince of Salerno, and, by the way, also the niece of the Duke of Sorrento. She was very educated by the standards of the times. Supposedly, she sometimes attended lectures at the School of medicine in Salerno. As an aside, this famous School of Medicine was the first Medical School in Europe. Legend has it that it was founded by a Greek, a Jew, an Arab and an Italian. There is certainly no doubt that there was a renascence of medical lore brought to the West by Jewish and Arab scholars about this time. Back to Sichelgaita, who was not only a good catch, she was also one of the most colorful women of the Middle Ages. From the time of their marriage she very seldom left Robert's side. When he rode out to do battle --and he was more often than not doing just that-- Sichelgaita rode out, too, clad in armor like any knight. One on occasion, when their troops began to run away from an attack, Sichelgaita charged after them with her sword raised high above her head and her long blond hair streaming out from underneath her helmet. Obviously, the men were more afraid of her than they were of the enemy for they did an about face and ran back to the battle. Other times when Robert had business elsewhere, she ran the show. What makes her even more amazing is that at the same tome she also managed to have 10 children. By the time Robert died, he and Roger had control over all of Southern Italy, even though Naples was still halfway independent and theoretically still tied to Byzantium. Plus, they had conquered Sicily from the Arabs. Soon after Robert's death, Roger became heir to all his titles, and upon his death they went to his young son, Roger II. Then, for all intents and purposes, his mother ruled the country for over 10 years until Roger grew to manhood. Later, Roger II supported Pope Anacletus against Pope Innocent.-- There were 2 claimants to St. Peter's at the moment, which was not unusual. There were Popes and anti-Popes galore throughout these centuries. Once there were 3 at the same time. In exchange for his support, Roger made a deal to get himself anointed King of all of Southern Italy and Sicily. The Pope even gave him Naples, even though it was never his to give away. So, now begins the Kingdom of the South, the Golden Years for Southern Italy, and for civilization. For the first Renaissance had begun --the 12th Century Renaissance. Many historians look on this 12th Century Renaissance as even more important than the one we know best, the 15th Century one. Civilization made such giant strides out of the dark. The cities began to prosper as trade increased. Also, the food supply greatly increased as agricultural skills, such as deep plowing and crop rotation were learned, and new lands were cleared. It was the tome of the beautiful Romanesque churches, and the even more beautiful Gothic architecture was beginning. Old Greek and Roman manuscripts were being translated, often from Arabic or Hebrew, into Latin. Aristotle was rediscovered. And, prose and poetry began to be written not only in Latin but also in the vernacular. It was the time that Abelard taught reason and logical thought in France. Along with this Rise in Learning, it was also a time of the rise in Institutions. This was exemplified by the founding of the great Universities, such as Paris, Oxford and Bologna. The University is uniquely a Middle ages invention. While ancient Greece and Rome certainly had Higher Learning, it was never organized in such a fashion. Since the Carolingian Renaissance there had been church schools? The great monasteries, such as nearby Monte Cassino had famous schools, but, of course, mainly to benefit their own ecclesiastics. Certainly, the famous School of Medicine in Salerno, founded in the 900s was the avant-garde of those to come centuries later. At the beginning of the 1100s, the Cathedral Schools were flourishing, the one at Chartres perhaps being the most renowned. In fact, the newly formed University of Paris grew out of the Cathedral School of Notre Dame, growing out of it almost literally by expanding onto the Petit Pont crossing the Seine and spreading out into the Left Bank, which from this time began to be called the Latin Quarter, for Latin was the common language of the students. Oxford and Bologna, however, evolved independently. During the early part of the 1200s other great universities were founded, such as Montpelier in the South of France and Salamanca in Spain. A group from Oxford broke off and started Cambridge, just as a breakaway group from Bologna started the University of Padua. It was during this period that the University of Naples was also founded. It began by importing Masters from Bologna to teach thereby encouraging scholars from the Kingdom to stick close to home. As a student, once you had passed all your rigorous examinations, you were ready for your "Commencement". We still use that term for our own Graduation ceremonies, but it originally meant that you were ready to begin teaching. I think it is amazing to realize that these greatest of universities during this Medieval Renaissance, and have continued to be among the greatest for over 800 years and are all still flourishing today. Courtly Love and the Age of Chivalry also coincided and were greatly influenced by the rise of the Cult of the Virgin Mary. One popular phrase of the day, exalting the Virgin Mary, says, "A God in Heaven, a Goddess on Earth". Now we know that putting a woman on a pedestal may have its limitations for both parties, but for civilization it was a step forward. It had a gentling effect on these often brutish, rough and ready times, and on the fighting knight. How did real women fare in this society? For the upper class or middle class woman, whose father supplied a dowry and chose her husband as well, she usually married very young, as young as 13 or 14 at times. Often her husband was also very young, so even if love was not expected on either side, some couples did grow up together and develop feeling for one another. There is a touching letter written by a young husband to his wife that he signed, Your Married Friend. For the Lady of the Manor, when her husband went off to the war or the Crusades or to court, often for months and sometimes years at a time, she was expected to look after things at home and to see that all his feudal rights and duties were observed. For the peasant woman, she had perhaps more equality, but a much more arduous life. She shared all the work in the fields, except the heavy plowing. In some jobs she had an exclusive, such as the care of the small farm animals and chores such as milking. A lot of women of all classes didn't marry for there weren't enough men to go around, what with the interminable warfare, the crusades, and, the church siphoned off quite large numbers into the monasteries or into the priesthood, although some priest did marry way up into the 13th Century. There was employment for women in the ever-growing cities; certain jobs in the cloth trade were reserved for women. For example, spinning cloth was always a woman's work and many an unmarried woman earned her bread by spinning. That's why, we still today often refer to an unmarried woman as a "spinster". Back to our Southern Italy-- The new kingdom had its brilliant capitol in Palermo --and it was a brilliant capitol-- and an enlightened one. Greek, Arab and Jewish scholars were welcomed and encouraged. It was a government that included all these diverse groups, often as ministers, and there was religious tolerance. The only restriction seems to have been that if you did convert to Christianity, it was a crime to change your mind. What did this unique kingdom do for our civilization? Lots! Many of the classics from ancient Greece and Rome were rediscovered and re-translated thank to the encouragement and support of Roger II and his sons and his grandson. This included not only classic literature, but philosophic and scientific treatises as well. For instance, at the beginning we were talking about that old Roman, Pliny the Elder. Besides being Admiral of the Fleet, he was much better known as a very prolific writer. Most of his books have been lost and gone forever, but his huge work on "Natural History" was rediscovered and translated during this time. After Roger's death, the Kingdom passed to his surviving son, William the Bad, and after his death to his son, William the Good. Society is not always very fair when it comes to judging its leaders --as you may have noticed even in our own time. In this instance, I think it was carried away by a pretty face, for William the Bad was really pretty good, and William the Good, who looked like an Adonis, was really pretty bad. Not bad meaning evil, but bad meaning stupid. He gave away the store, in this case, the Kingdom. All through these years of Norman rule, the Popes had mixed feelings about these Norman upstarts who they nevertheless had to depend on at crucial times to protect them from either the Byzantium Greeks or from the Roman populace who rose up against them from time to time. Most of all, the Normans were a curb against the power of the Holy Roman Emperor who had control of Northern Italy and might pose a threat to the Papal states that stretched across the middle of the country. Their greatest fear was that the Emperor, who always had his covetous eyes on the South, would succeed in conquering the South and the Papal States would be squeezed out of the middle. William the Good who also feared the Emperor, and who was always afraid the Emperor would invade at any time, one day had what he considered a brilliant idea. He would bring his young aunt Constance, King Roger's youngest daughter, out of seclusion- possibly from a nunnery --and marry her to Henry VI of Hohenstaufen, the son of the Holy Roman emperor. I can just imagine the Pope in Rome when he heard the news, ranting and raving about that "cretino"; that "idiota" from the south. William and his wife, the sister of Richard the Lion-Hearted, produced no offspring, so when William died young, the very thing the Pope had feared came to pass. Henry, claiming the throne in his Norman wife's name, marched in and conquered the South. However, when he was being crowned in Palermo, his wife was not at his side. Constance, at age 40 was pregnant, so she was making her way down from Germany. At Iesi, a town on the Adriatic side, her time came. Now, because of her age Constance wanted to forestall any rumors that the child wasn't really her own, so she had a large tent erected in the main piazza and invited any matron of the town who wished to come witness the blessed event. Thus was born one of the outstanding men of the Middle Ages --or perhaps of any age-- Frederick II. His contemporaries called him "Stupor Mundi", the Wonder of the World. Frederick's father, Henry, didn't last very long, much to the relief of his subjects for he wasn't a very nice man, and his mother died a year later when Frederick was still a small child. Constance did do what she could to protect her child, she made the Pope his guardian. While he was growing up in Palermo, he was educated but not particularly pampered or cosseted. In fact, he was left pretty much alone to roam the streets of his exotic capitol, and he learned from everything he saw and from everyone he met. Most of all, he learned to depend on himself. The main thing the Pope didn't want was that Frederick should ever go to Germany and be confirmed as the Holy Roman Emperor, as successor to his father, which would mean he would rule the city states of the North while at the same time being King of southern Italy and Sicily. But, as soon as Frederick became an adult, that is exactly what happened. From then on it was warfare, waged by the Pope either trying to promote rebellion in the North of by excommunicating Frederick from time to time. Meanwhile, Frederick left his eldest son as his stand-in up in Germany and spent all of his time in his Southern Kingdom which he greatly preferred. His was the most advanced court in Europe, and perhaps the wealthiest. Certainly it was the most tolerant-- which was another reason the Pope was so antagonistic. Frederick enjoyed all the diversity of his peoples. His personal bodyguard was essentially Saracens who were intensely loyal. He gave them a town in Apulia, Lucera, and built them a mosque. He declared another town in Apulia, Altamura, as a safe haven for Arabs and Jews outside of Sicily, where they had always been accepted. Frederick also gave his people a Constitution, the first constitution since Roman Justinian's code of laws; one that guaranteed the common people certain rights and protected them against the abuses of the feudal barons. For this, the Pope excommunicated Frederick again, accusing him of weakening feudal ties. Also, it was at this court that for the first time in Italy poetry was written in the vernacular, evidently some of it by Frederick himself. He certainly wrote a very scholarly book on Falconry that was used a reference work for centuries. As an aside, I know that many travelers seldom come south of Rome. I think southern Italy is one of the undiscovered treasure troves of Europe, at least as far as most American tourists are concerned. Aside from the wonders around the Bay of Naples, there is Apulia, the region right across from here on the Adriatic side with its beautiful Romanesque churches, such as the one at Trani, which I think is the most lovely cathedral in Italy. And, there are castles galore. 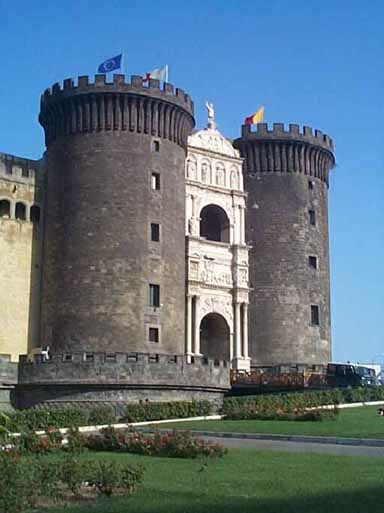 One of the most marvelous ones is Frederick's Castel de Monte, a true architectural sculpture. It sits on a high hill out in the middle of nowhere with a panoramic view of the countryside. It is octagonal in shape with 8 towers which also have 8 sides. To anyone venturing into Apulia, it is well worth a side trip. Sicily is spectacular with its Greed temples and Byzantine mosaics. The Palatine Chapel in the Norman palace in Palermo is encrusted with brilliant mosaics. When the French author, Guy de Maupaussant visited it he said it was "like stepping into a jewel". Frederick died in 1250, still engaged in the battle with the papacy. He had been excommunicated again which is why Dante in his "Inferno", even though he was personally sympathetic, left him in Hell. Manfred, the son who succeeded him, got to go to "Purgatory". Even before Frederick's death, and especially afterwards, the Pope had been trying to tempt either the King of France or the King of England to invade and conquer the South. At one point the King of England toyed with the idea of it for his son, but the one who really liked the idea was Charles of Anjou, the brother of the King of France. So Charles raised an army as did the Pope and they ended up defeating and killing King Manfred at the battle of Benevento in 1266. The Pope then anointed Charles King of southern Italy and Sicily and Charles declared Naples as his new capitol. Thus the Angevins took the South. The Pope did win his battle, but at the tremendous cost of weakening the Papacy. Not too many years later, the Pope and the Cardinals were driven out of Rome and fled to Avignon where they stayed for 70 years, often under the thumb of the French king. Meanwhile back in the Kingdom of the South, with the rise of Naples, Apulia and Sicily declined in importance. Also tolerance for diversity was fast disappearing. It was still a rich kingdom and Naples was still an intellectual center. The University of Naples, which Frederick had founded, still flourished --as it still does today. However, Sicily did not remain part of the Kingdom for long. The Sicilians never took to their rather arrogant French masters, so one evening when a French soldier insulted a local girl, they rose up and massacred the lot of them. That historic and bloody event is called "The Sicilian Vespers". Shortly afterwards the Sicilians, feeling they needed some outside support, offered the crown of Sicily to Peter of Aragon from Spain, who had married Manfred's daughter. The Kingdom no longer included Sicily and would not do so again for over a 100 years. Before losing Sicily, Charles had had ambitious plans to conquer new land across the Adriatic and, at that very moment was preparing to invade North Africa. You could say he was a bit bitter, but he was also pragmatic for his comment was, "Lord God, since it has pleased You to ruin my fortune, let me only go down by small steps". 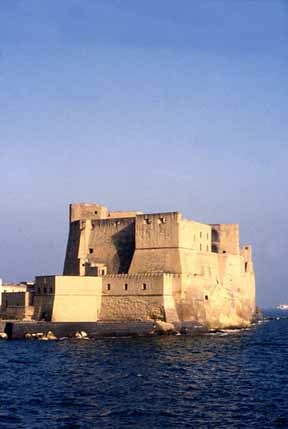 In Naples there are two splendid medieval castles, called the Castel dell'Ovo and the Castel Nuovo, the Egg Castle and the New Castle. The Egg one which juts out into the sea, was built by William the Bad in the 1100s and the New one was built by Charles of Anjou in the late 1200s. The reason that first old fortress is called the Egg is because it is said that the Roman poet, Virgil, who was sometimes regarded as a magician by the Middle Ages, buried an egg on that spot, and if the egg ever breaks, Naples will cease to be. There are many stories connected to these two old castles, some of which are rather bloody. One prisoner who must have despaired inside the Egg was the young 16 year old grandson of Frederick II, Conradin. All Europe was shocked when King Charles had this young boy publicly beheaded in the Market Square in Naples. Charles, a ruthless man, was determined to leave no possible heirs of Frederick free to claim the throne. One of his prisoners who was held in the Egg for many long years was the younger daughter of King Manfredi. After the death of her father, she had been captured along with her mother. They had been imprisoned in the castle of nearby Nocera for some years until the mother finally died. Beatrice was then moved to the Egg. Years later, when Charles was away seeing to his other lands in France, for he still had Anjou and he had acquired Provence by marriage, he left his poor benighted son, the future Charles II in charge with strict orders not to engage in battle with the Aragonese of Sicily if they attacked during his absence. Charles II was a very insecure diffident young man who was scared to death of his awesome father. When the Aragon king of Sicily sent his admiral, Roger of Lauria, to besiege the islands around Naples, Charles II was faced with such a dilemma. He was finally out-finessed and was captured. Now the Admiral had another mission given to him by King Peter and his Queen which was to rescue the Queen's young half-sister, Beatrice. The Admiral then told the Neapolitans that if they ever wanted to see their Prince Charles alive they must release Beatrice. So, after 18 years of captivity, Beatrice sailed away from the Egg and, let's believe, she lived happily ever after. When king Charles returned to Naples he was furious. He obviously didn't have a great deal of fatherly feeling. He remarked about is son, "Who loses a fool, loses nothing. Why isn't he dead for disobeying me?" After poor Charles II, came the best Angevin of them all, King Robert the Wise, the Philosopher King. He held court in the new Castle and it was a very intellectual court. Robert not only supported the University of Naples, he often attended the lectures given there. He also commissioned many translation of newly discovered classics and collected a fine library. It is well to remember that when we talk of medieval libraries we aren't talking about the voluminous libraries of our time, or even ones as large as many of our home libraries. Fifty to one-hundred books would have been considered quite substantial. Here in Sorrento, if you once more stood on the cliffs and looked at the nearest point of land, and if you had super vision, you could see the ruins of an old Roman villa, and what is known locally as "The Baths of Queen Giovanna"--"I Bagni della Regina Giovanna". This lovely spot is made by the sea coming in under an arch of rocks to form a wonderful natural swimming pool. Local legend has it that the Queen was such a nymphomaniac that she took one lover after another, often times brought one out for a dip, and when she had had her way with him, threw him off the cliff. Giovanna was a much maligned queen during her whole reign. We think of gossip columnists and yellow journalism as belonging to our own time. But the Middle Ages, and perhaps every Age since the beginning of recorded history, has had its counterpart of the national Enquirer or the vilifiers of Talk Radio or even the propaganda of the the so-called responsible Press. Throughout the Middle Ages, there were chroniclers, record keepers, the historians of the time, who spread terrible rumors against any leader of the opposition. I think too often some past historians have either been much too uncritical of any old scribe or else have been much too titillated by all that salacious gossip that has been passed down through the centuries. Giovanna's luck never changed. In the end, she was besieged in the new Castle by her nephew, Charles of Durazzo. After promising her a safe conduct if she surrendered, he had her bundled off to a castle in Basilicata and there had her smothered to death with a pillow. Rene of Anjou was the last unlucky Angevin to rule the kingdom. He was overthrown by Alfonso, the Aragon king of Sicily. Now for the first time in over 100 years the Kingdom was reunited once again. It was now, also the first time it was officially called "The Kingdom of the Two Sicilies". Alfonso, like many of his predecessors, was a learned man. He particularly loved the works of Livy and anything that smacked of ancient Rome. Before he made his official triumphal entrance into Naples, he caused a large hole to be made in the city walls so he might drive his Roman chariot through the breach, and through the street of the city all the way to the New Castle. A lovely, white, carved marble arch made to commemorate his victory still stands over the entrance to the castle. After Alfonso came his illegitimate son, Ferrante, a very disagreeable, sadistic young man. After making peace with some of the rebellious nobles of the realm, he invited them all to dinner in the New Castle. After a sumptuous feast, for dessert he called in the soldiers who killed some of them and threw the rest in the dungeons. Supposedly, Ferrante kept a crocodile or two swimming around in the moat outside for fast and easy executions. His successor, Alfonso II did patronize the Arts, but he seems to have inherited the same propensity for cruelty. They called him "Dio delle Carne" Perhaps, that could be loosely translated as "God of Beastly Habits". After came Ferrante II, and then the last of the Aragon dynasty, Federigo, who was defeated by his Spanish cousins. For the next couple of centuries --1516 to 1713-- the kingdom was ruled by Spanish Viceroys, appointed by the Spanish Hapsburg kings. It was almost a feudal land during these centuries. The taxes were oppressive and the government tended to be ever more repressive. The nobles were encouraged to leave their large estates and settle down in the capitol to a life of luxury in their grand palaces Obviously, the barons were much easier to control in the city and there was much less chance of rebellion. A few statistics that are fascinating and illuminating: In 1723, in the Kingdom, the Church owned 2/3rds of the landed property, the nobles owned 2/9ths and that left 1/9th for the rest of the people. At the beginning of the 17th Century, Naples had a population of over 300,000, making it the second largest city in Europe, after Paris. By the end of the 1600s, it was still about the 4th largest. The Spanish Viceroys were replaced by the Austrian Viceroys, appointed by the Austrian Hapsburg kings. 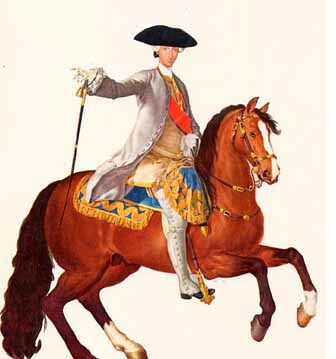 They ruled the kingdom for 21 years from 1713 to 1734 until Charles III, the son of the Spanish Bourbon king, was given the throne as part of the '"rearrangement" of Europe by the great powers after the War of the Polish Succession. The Neapolitan Bourbons had a long reign from 1734 to 1860. The First one, Charles III was certainly the best and the brightest. During his 25 years as king he built the San Carlo Opera house, the Royal Palace in nearby Caserta --said to rival Versailles-- and also the lovely Capodimonte which now houses Naples magnificent Art Museum. After the death of his father, Charles sailed off to become King of Spain, leaving his young son, Ferdinando to rule the kingdom. He also left an older son in Naples who was, to put it in clinical terms, "crazy as a loon". Very wisely he left an able administrator in charge, Tanucci, to help, or lead, the young Ferdinand. Unfortunately, Ferdinand IV (later known as Ferdinand I) was not very well educated. His parents were afraid too much study would overtax his brain and he might end up as "bonkers" as his older brother. Ferdinando and his successors lived and ruled during often tumultuous and dramatic times in history. With the exception of Charles III, they could, not too unjustly, be called the "Boring Bourbons". Ferdinando I's main pleasure in life was hunting in the royal Preserves outside of Naples where he could bang away all day at any thing that either flew or walked on four legs. He married a very industrious woman, Maria Carolina, daughter of the Empress of Austria Maria Theresa and sister to Marie Antoinette. For many years, Maria Carolina, first with the minister, Tanucci, and later with another famous minister, Acton, in effect, ruled the kingdom, although Ferdinando did have absolute veto power which he exercised from time to time. Twice during his long 65 year reign, they had to flee to Sicily. They fled the first French invasion in 1799. The French Revolution had a tremendous impact on political thought throughout Europe. Even though in the Kingdom its republicanism never filtered very far down into the ranks of the common people, there grew up among the more progressive minded educated men and women a great yearning for political reform and for an end to absolute monarchy with its often despotic laws. At the time of this first French invasion, after the Bourbons fled to Sicily, a Republic was established in Naples, the Parthenopean Republic, so called after the name of the first Greek city to be built on the site before Naples, the city of Parthenope. Alas, the Republic lasted less than a year before the Royal Forces, with the help of the English Admiral Nelson, defeated it and hung most of its leaders. Ferdinando and his Court returned to Naples until 1806, when once again they were forced to flee to Sicily after Napoleon invaded and conquered Italy. Napoleon installed his brother, Joseph Bonaparte as king in Naples. But, after a couple of years, Joseph went off to become king of Spain, and Napoleon's brother-in-law, Joachim Murat, became king. Actually, Murat did manage to institute some much needed reforms into the kingdom, but all was undone when he and Napoleon were defeated. Once more the Bourbons returned to rule in Naples. Ferdinando's son, Francesco I, succeeded to the throne, but only lived to reign for 5 years, before his son, Ferdinando II became king. Ferdinando II was a hail fellow-well met sort. Hunting was still the family addiction. The king couldn't speak Italian. He spoke only Neapolitan, which was the official language of the court. Ferdinando's nick name was the "Bomba", meaning "Bomb", supposedly stemming from his plans for a bombardment that never came off. Looking at his portraits, it seem perhaps he should have been called a "Bomb" because he was so big around he looked as if he were about to explode. All in all, Ferdinando II was a fairly popular king, although his rule was far from an enlightened one, but then, he wasn't a very enlightened man. He did try to do some things to improve the lot of his people. He built the first railroad in Italy, and he also built the coast road from Naples to Sorrento and on to Amalfi. Before this road, travelers usually had to go by boat to towns down the coast. 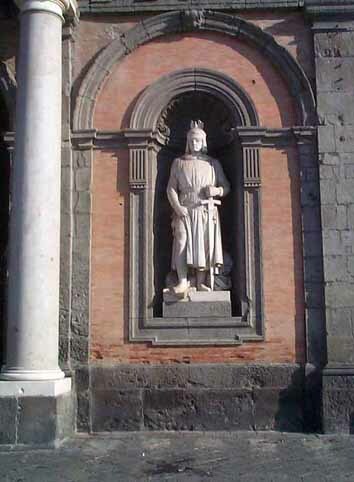 The last Bourbon king was the ill-fated young man, Francesco II, whose reign only lasted a year before he was defeated and forced to flee into exile forever. For now, in 1860 Garibaldi, one of Italy's greatest patriotic heroes, marched into the South. For it was the historic time of the Risorgimento, the Unification of Italy into one nation. Thus the Kingdom of the Two Sicilies ceased to be. Naples was no longer a royal capitol. However, it remains, for many of us, a splendid, exciting city, one of the oldest and historically rich cities of Europe, and one of the most beautiful.